Discovery Aquatics - Efficiency and Excellence for Everyone » The Mind’s Eye – what is in your swim scene? The Mind’s Eye – what is in your swim scene? The Mind’s eye. What does that mean to you? By definition it is the ability of the human brain to visualize; to conceive images or recollect scenes. These mental images are formed by accessing our memory, or created by modifying stored perceptions. It is an incredible function of the human mind, and a completely private event. Our scenes are not tangible nor available for anyone else to see. Mental imagery has a role in many aspects of life – holding memories, planning, goals, dreams, decision making and motivation. 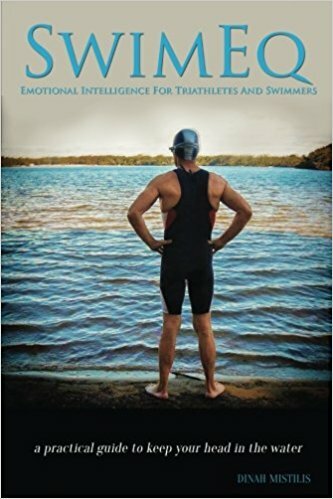 In sports and swimming we can use mental imagery to develop skills, build on strengths and find weaknesses and of course to compete effectively. Each persons ability to create mental imagery or visualize is unique. Not really a surprise as we all see real objects differently, and we all have our own bank of memories and perceptions. And for a small percent of the population they are unable to ‘see’ anything. 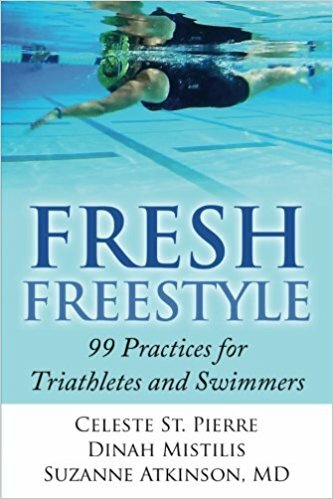 In a recent chat amongst Fresh Freestyle co-authors, I asked them to share what they ‘see’ when they swim. Coach Celeste ‘sees’ in movies. When she is swimming, her visualization is displayed as a movie of herself in that swimming moment. Coach Suzanne prefers to ‘see’ visuals as either stills, or in motion, of others swimming with correct form for her to emulate. How about you? What do you ‘see’? I usually begin a swim with a real time visual of what my mind sees me doing, then change to isolated stills when I am correcting form or feeling movements. These stills are sometimes of myself or swim figurines. I asked Coach Celeste to sketch an image of an example image I might see. I felt connected and synchronized with the swim movements. My mental image then changed backed to a real time visual of myself swimming to reinforce the stability I had found. Find a still image of someone swimming that you would like to swim like. Look at every detail on the image. Now close your eyes and try to recreate the picture. Try and find every detail in your mind. Open your eyes to get more details if you need to, then close your eyes and find them in your mental image. Repeat as often as you can. When you feel yourself get good at the recall, move to another image or go on with the next exercise. You may even use the first image from this post if you like. 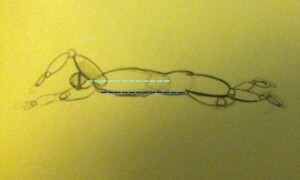 Find a video of someone swimming efficiently. After watching, close your eyes and try to recall the image of the moving swimmer. Go into as much detail as you can about the swimmer and they way they move. Are you able to see this athlete in 3 dimensions? Practice often, and view the mental scene from many angles. Here is a great video to watch. Move on to this exercise when you feel ready. Find one of your favorite videos from exercise 2. Now in your mental scene, replace the swimmer with yourself. After you feel good placing yourself in the scene, connect to the imagery with your senses. How does the swimming feel on your body and muscles? What is the water temperature? How does the water feel on your face and body? What can you hear? Smell? Add one challenge at a time to enhance your ability to visualize effectively. For an added challenge, repeat this exercise with your eyes open. Can you do it? After you have been strengthening your ability to create mental imagery on land, now take it to your swimming. Repeat the steps above progressively with your swim practices. What have you learned about yourself and your swimming?